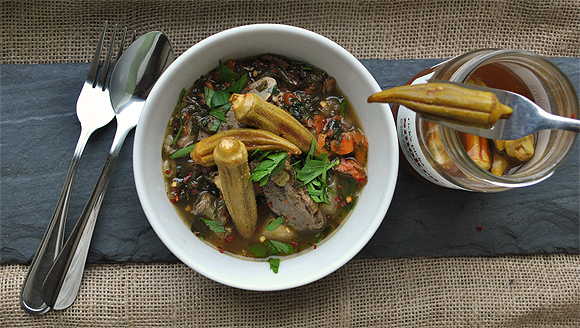 This Duck and Turnip Stew with Dandelion Greens recipe is a new take on southern soul food and we promise it will not let you down! Give the recipe a try and find out just how good southern soul food can be! You can enhance this recipe with our Wild Mushroom and Sage Olive Oil! If blessed with skills to chop a duck into pieces, go for it. If not, ask a butcher to chop it into 2 legs, 2 wings (throw away the third part or save for homemade stock), the back cut into two parts, and 2 breasts (Request the breast meat be removed from the bone). Once home, clean the pieces. Rub with olive oil, sea salt, fresh black pepper, crushed red pepper, and two cloves of minced fresh garlic. Let marinate for at least three hours or overnight. Place aside. Bring broth to a simmer in a medium pot. Turn off heat and set aside. In a large pot, heat 1 tbsp. of olive oil over medium-high. Add duck bacon to the pot. If necessary, empty excess fat into a container. * When bacon is crispy, remove onto a paper towel lined plate. Place duck fat and bacon (separately) aside. Working in batches (don’t overcrowd the pot) over medium heat in the same pot as the duck bacon, brown both sides of the duck legs, wings and back (Note: The back is for flavor, be careful not serve it when the stew is complete). Set the duck breast aside. Remove pieces to a paper towel lined plate. Set aside. (Note: Occasionally, empty excess fat into the same container as the duck bacon fat and set aside*). Add chopped turnips to the pot. If the pot is too dry, add a little of the duck bacon fat. Caramelize all sides to golden brown. Remove to a paper towel lined plate. Set aside. Add onions, carrots, celery, garlic, sea salt, fresh black pepper, and smoked paprika. If the vegetables seem a little dry add a little duck fat or a tablespoon of broth. When the vegetables start to soften, add the warm broth, wine, bay leaf, anise, chili peppers, orange zest (optional), thyme bunch, and parsley. Partially cover and bring pot to a slow slimmer. Cook for about 1 hour or until the duck is thoroughly cooked. Occasionally, adjust the seasoning. Meanwhile, finely slice the fat of the duck breast, being careful not to cut into the skin. The skin should have a crisscross pattern with lines a quarter inch apart to help release excess fat when the breast is seared. Heat a black skillet over medium-high heat. Do not add any oil, because the duck breast has lots of fat. Add the breasts, fat side down to the skillet. Using a heavy object to apply pressure to the duck breast (Use a heavy brick wrapped in foil or a smaller heavy pan topped with canned goods). Cook the breast to a golden brown. Occasionally, empty excess duck fat into a proper disposable container to prevent the ‘liquid fat’ from steaming the breast (an undesired result). After about 3 to 4 minutes, flip the breast over to sear for another 2 to 3 minutes (vary this time based on a personal preference for wellness of meat). Remove breast to a paper towel lined plate. Quickly season with salt and pepper. Let the breast rest on a paper towel lined plate and thinly slice. Ten minutes before the stew is done, return the turnips to the pot. When the stew is done, turn off the heat and add half the duck bacon. Ladle soup into individual bowls. Generously garnish with dandelion greens and duck breast slices. Sprinkle duck bacon on top of the bowl. Serve with wild brown rice and pickled vegetables. Adjust seasoning. *Note: Save excess duck fat to use in a roast or saute vegetable recipe. Recipe and photo from: http://blog.sanuraweathers.com under the Creative Commons Attribution-NonCommercial-ShareAlike 4.0 International License.